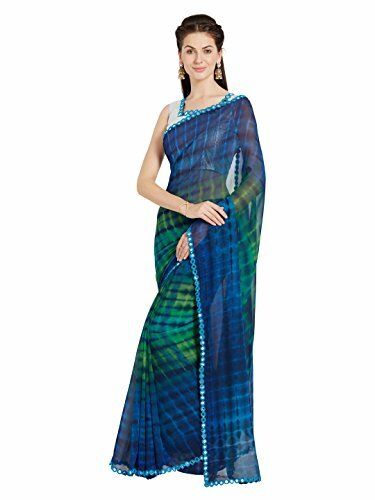 This can be a Faux Georgette Printed Party Wear Saree.This Saree comes with an attached Art Silk blouse fabric which may also be customised from 32″ to 42″.|| Usage Ideas: Wear this saree for special occasions, festivals, friends/family get-togethers, parties, ceremonies or rituals.|| Design Speciality: This is a Fancy Print design saree which is the recent and trendy design innovation and is highly appreciated design inspired by 2017 ethnic trends. || Fabric Features: The fabric is comfortable and easily drapes around your body to give you the perfect fit and shape. || Suitability: Housewives, working women, girls, newly married. Also suitable for gifting to wife, sister, mother, friend on anniversary, birthday, festival, diwali, pooja, raksha bandhan, grah pravesh, marriage. Mirchi Fashion (division of Sourbh Sarees) brings together the most productive of Ethnic Fashion from the Indian subcontinent to Indian wear lovers across the world, with various popular and trendy ethnic products for more than a few occasions – wedding sarees, Party Wear Sarees, to latest Indian suits and salwar kameez. Note: This saree is of 5.5 meters length (FREE SIZE) comes with an additional unstitched Blouse piece/fabric of 0.8 meters in length, attached with the saree itself. DOES NOT include underskirt(peticoat) or fall pico. Product will be delivered within 7-12 days after order confirmation. Declaration – Buy ORIGINAL and EXCLUSIVE Sourbh Sarees products from the seller “SOURBH SAREES or MIRCHI FASHION-division of Sourbh Sarees” only. Sourbh Sarees has not authorized any other sellers to sell their products. All other sellers is also selling FAKE and DUPLICATE Sourbh Sarees products of inferior quality at lower prices. Sourbh Sarees does not provide any quality assurance for products bought from other sellers.